Disney is celebrating another box office win this weekend with its swashbuckling adventure Pirates of the Caribbean: Dead Men Tell No Tales. It is coming away with an easy win, earning $77 million over the four-day holiday weekend. That debut also continues a downward box office trend for the Pirates of the Caribbean franchise, with the last installment, 2011's Pirates of the Caribbean: On Stranger Tides, debuting with $90.1 million in this same weekend frame back in 2011. A new report reveals that this weekend as a whole marks the lowest Memorial Day weekend gross since 1999, when the first Star Wars prequel, The Phantom Menace reigned supreme. Variety reports that the total box office earnings for this weekend add up to $172.3 million, which is the lowest Memorial Day box office since the $142.5 million total from the Memorial Day four-day frame in 1999, when The Phantom Menace, in its second weekend in theaters, easily won with a four-day tally of $66.9 million, beating newcomers Notting Hill ($27.6 million) and The 13th Floor ($4.2 million). 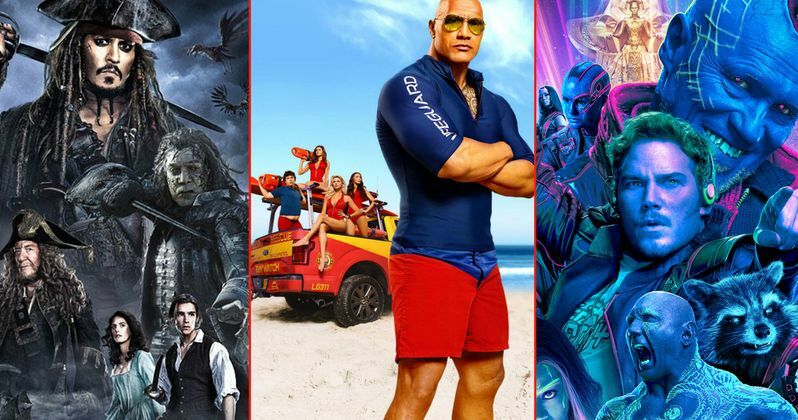 Here's what Paul Dergarabedian, Senior Media Analyst at ComScore, had to say about this horrible weekend at the box office. "It's crunch time for the industry after a lackluster May and a dismal Memorial weekend. The good news is that June looks to deliver the goods and no movie is better suited to lead the cavalry charge than Wonder Woman later this week. The pressure is certainly on for the final three quarters of the season to get us out of this downturn." The only bona fide hit of the summer movie season this year has been Guardians of the Galaxy Vol. 2, which, over the weekend, surpassed the original Guardians of the Galaxy movie both domestically and globally, after just four weeks in theaters. Still, subsequent movies like King Arthur: The Legend of the Sword, Snatched, Alien: Covenant and Everything, Everything have failed to impress thus far, although this downturn could very well be reversed by Wonder Woman. However, box office tracking for this movie has been inconsistent, at best, with analysts predicting an opening weekend of anywhere between $65 million and $105 million, when it hits theaters next weekend. It's also worth noting that, 10 years ago this weekend, the final installment of the original Pirates of the Caribbean trilogy debuted, Pirates of the Caribbean: At World's End. That movie opened huge with $139.8 million, opening in 4,362 theaters for an impressive $32,050 per-screen average. The next movie in the franchise, 2011's Pirates of the Caribbean: On Stranger Tides, also opening on Memorial Day weekend, earned $90.1 million, with a $21,697 per-screen average from 4,155 theaters. Pirates 5's $77 million tally came from 4,276 theaters for a $18,018 per-screen average. Pirates of the Caribbean: Dead Men Tell No Tales has been performing well overseas, so perhaps it could still earn a healthy profit while continuing its domestic downward trend at the box office.